In May, we started the arctic summer season a.k.a. sailing season on good old SV Antigua. We took off in Bodø in north Norway and spent a couple of lovely days in Lofoten and Vesterålen, before we ventured north across the Barents Sea. I have to admit that I did not expect too much from this year’s visit to Bear Island (Bjørnøya), based on the weather forecast that we had when we left Tromsø. But it was so good that we ended up spending two days rather than just one at Bear Island! 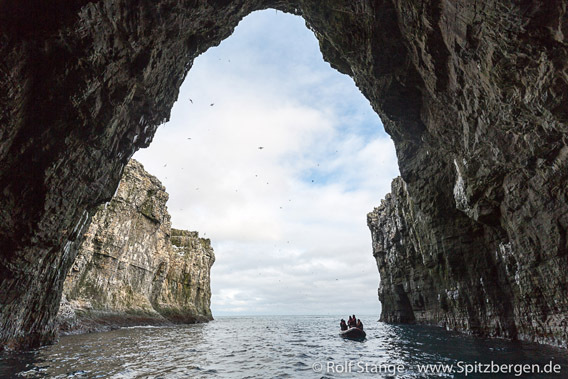 Coastal scenery on Bear Island: passage of Perleporten. Of course we still had some great days further north in Spitsbergen, but Bear Island is really something special and it did definitely not disappoint this time.